With its varied landscape of shimmering seas, undulating hills populated with olive groves, and the inky form of smoking Mount Etna, Sicily is regarded as the jewel of Mediterranean. A melting pot of culture, it is home to many of the world’s most revered examples of Greek and Roman architecture, while its gastronomic scene draws on an array of culinary influences. With parts of the island on the same latitude as North Africa, autumn is the time to visit, as the soaring temperatures of summer — as well as the throng of tourists — subside and cool breezes sweep the land. 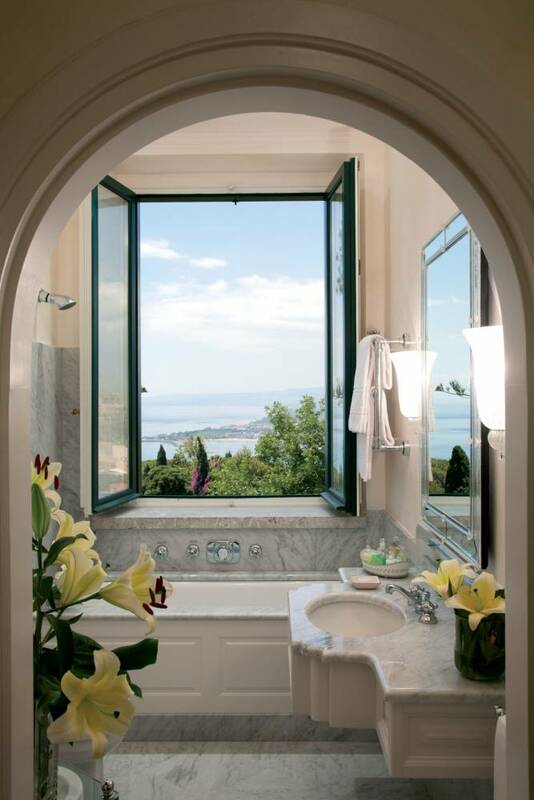 There is no better place to start than hillside village Taormina. For an unforgettable stay, book into Belmond Grand Hotel Timeo (belmond.com). The classical villa is enviably positioned, built into the rugged cliffs just below the crumbling, third-century BC Greek amphitheatre. With cascading canopies of purple bougainvillea and sweeping views of Etna and the shoreline, it is wonderfully romantic. The stately rooms all face the sea, while suites take luxury to the next level with private balconies and two gleaming marble bathrooms. After settling in, take a dip in the serene pool, where impeccably dressed staff will ensure you are well attended to before sipping cocktails on the terrace while watching the glittering town come alive for the night. For an even loftier view, Villa Ducale (villaducale.com) is perched high above the town. This airy, well-designed family-run boutique hotel embraces a home-from-home atmosphere, chairs and sofas are sink-into-them soft and furniture is rustic-chic. Spending time drinking in the views is encouraged, with rooms opening on to peaceful terraces. The open-air dining room is an elegant spot for lunch; choose a simple dish of grilled fish and steamed vegetables paired with a cool glass of lemon-hued Etna white wine. An impressive breakfast buffet is a treat in the morning, with sticky tarts and freshly squeezed raspberry juice. 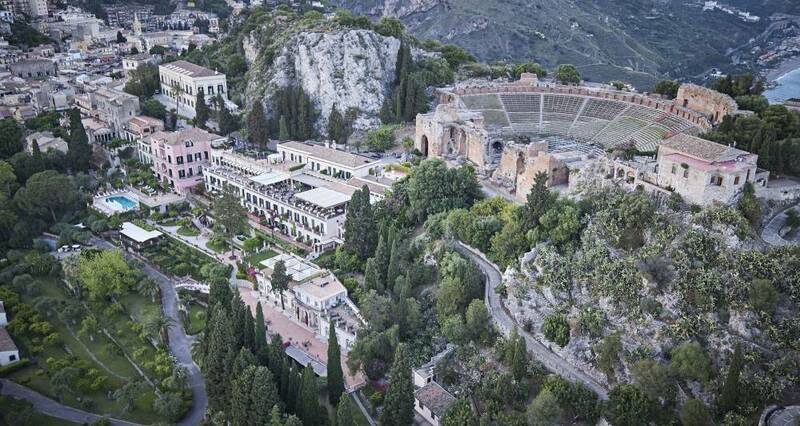 After time in Taormina, jump in a taxi or hire a car and travel across to the south coast to Verdura Resort (roccofortehotels.com). Set in 230 hectares of groomed, gently rolling countryside, the resort comprises three golf courses, clay tennis courts, football pitches and volleyball, putting the emphasis firmly on health and outdoor living. The spa bar offers guilt-free, plant-based dishes such as tomato and strawberry gazpacho, while thick orange and almond juice at the granita bar provides a quick restorative boost. It’s a good spot for pampering, too, with its award-winning spa offering treatments such as the Rocco Forte Body Ritual, while the open-air thalassotherapy pools boost circulation. The main draw is the palm tree-lined 60m infinity pool, although the private beach is a better spot for serious sunbathing. Enjoy a laid back lunch of pizza and a caprese salad at Caffe Wunderbar (wunderbarcaffe.com). It would be remiss not to try one of Sicily’s signature pastries while visiting, so round off your lunch with a cannoli — a deep-fried pastry tube filled with sweet ricotta — and a strong espresso. A shuttle bus ferries well-heeled holidaymakers from Hotel Timeo to Belmond Villa Sant’Andrea (belmond.com) every hour throughout the day, so make full use of it with a trip to its seafront restaurant, Oliviero. Looking out over the hotel’s rugged private beach, the restaurant serves up simple yet well-executed Sicilian cuisine using local ingredients. The clientele here are a mix of old money, glamorous European socialites and film stars, so settle in and people-watch over a bottle of crisp pink Etna Spumante, before feasting on dishes such as island-grown melon and prosciutto and busiate pasta smothered in tomato and almond pesto. Alternatively, dine on the roof terrace at Villa Carlotta, taking in the panoramic views (hotelvillacarlottataormina.com). Dotted with lanterns, the honey-hued tower is a sheltered spot where the spoils of the sea or grilled meat dishes can be enjoyed. Try the tuna medallion edged with sesame seeds or the rocket and steak salad. 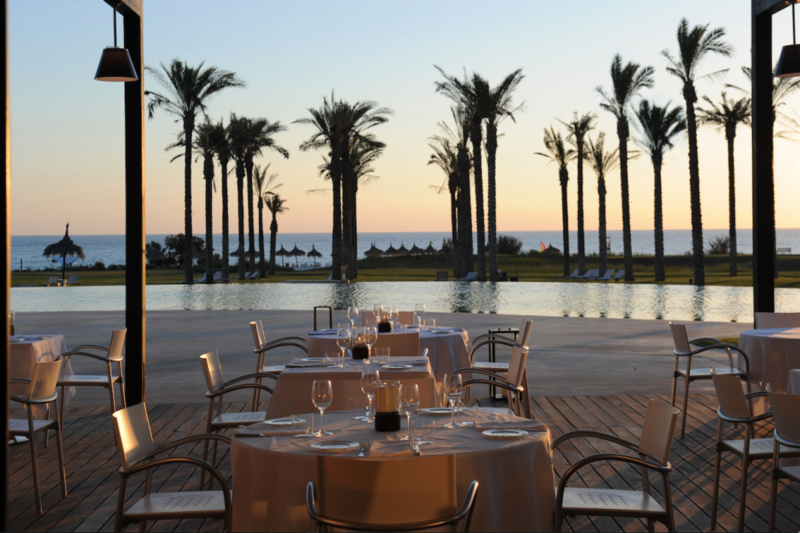 Verdura Resort’s colourful, family-friendly trattoria Liolà, offers wholesome fare such as cacio e pepe ravioli, pizza and barbecue-grilled fish. Or, for fine dining, book a table at its two-Michelin-starred Zagara, which serves up impeccable fish dishes such as red prawns with a broad bean cream. 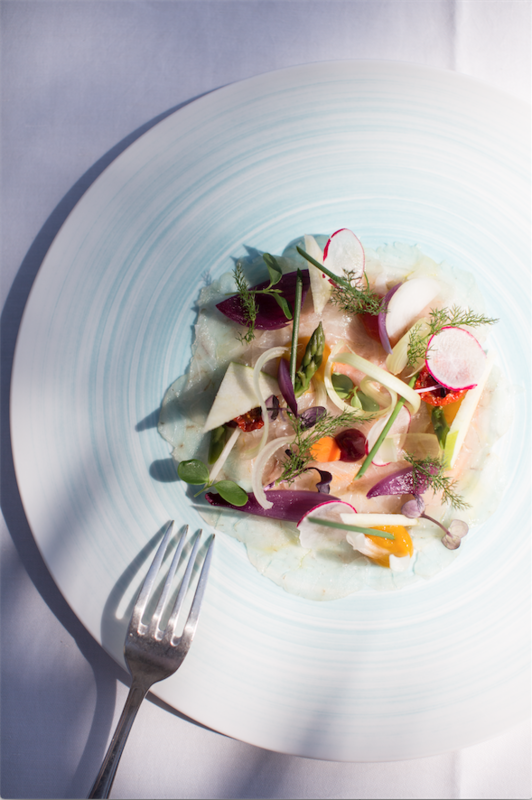 With views over the palm-tree-flanked pool and the sea, it is an informal take on haute cuisine. 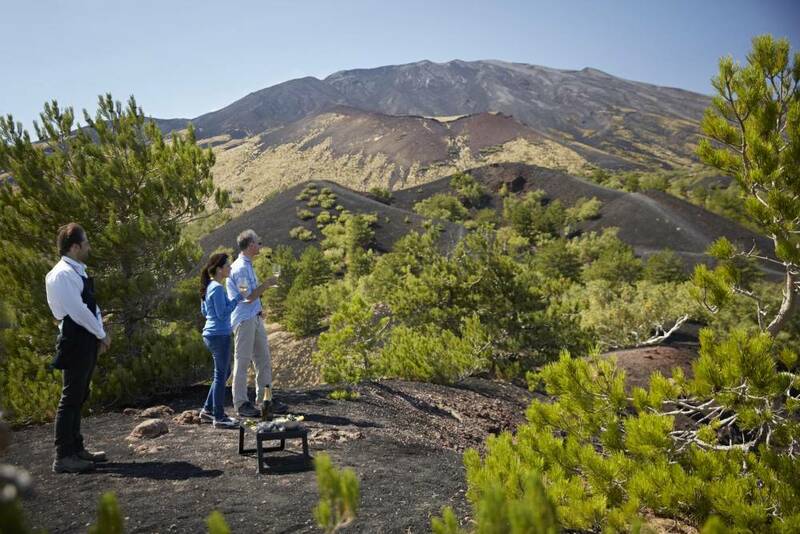 Dominating the landscape, Etna provides an irresistible draw. Arrange for an early morning taxi to take you to the lava flows for an otherworldly stomp on the scorched black terrain. Then head down to the coast and take a boat from Villa Sant’Andrea around the rugged shoreline. Jaunty flowerpots and patterned plates are sold everywhere in the old town. If you don’t have room for these in your suitcase, Scandurra Taormina (scandurrataormina.com) stocks floaty print dresses by Duerruote featuring pottery-like patterning, as well as eye-catching swim shorts featuring tomatoes, chillis and local flora by Costumi di Sicilia. On the busy Corso Umberto, artful maps and beautiful, old-fashioned drawings of fish, fruit and coral on thick card can be found tucked away in display cabinets at antiquarian art gallery L’Agora (lagora-taormina.it). Or for a more quirky purchase, Gufo (gufodesign.com) makes eco-friendly, wooden-framed sunglasses with colourful, mirrored lenses. 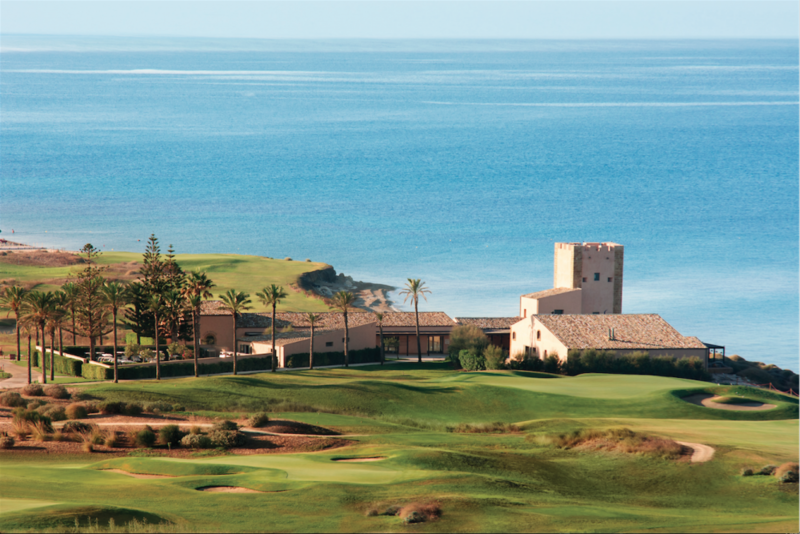 Mariù back at Verdura Resort is a must. Created by Sir Rocco Forte’s wife Aliai, it stocks unique womenswear handmade by local craftswomen from materials such as lace and crochet.